You know how much I love Shannon Hale and she's written a book for us adults! Woo hoo! I truly did not think that this book would ever be published. It was a side project for so many years, just a fun story I kept returning to, quite different from anything else I was writing. It's just so fun to see it coming about. It's just such a gooey chocolate cake of a book for me, a steaming plate of chocolate chip cookies, a carrot pudding with rum sauce. A gooey chocolate cake of a book is a perfect description. Jane Hayes is a graphic designer in New York and not getting any younger. She can't find a man to live up to the expectations set by one Mr. Colin Firth playing Mr. Darcy in the Pride and Prejudice. See, this is something I can totally understand. Shannon Hale has a minor Colin Firth obsession. In the acknowledgements she assures her husband "you know this Colin Firth thing isn't really serious... It's just a girl thing, I swear." I'd just like to take this moment to assure my husband the same thing. But he can still give me Colin Firth movies for Christmas, I really won't mind. Also, I love her dedication: "For Colin Firth-- you're a really great guy, but I'm married, so I think we should just be friends." If you understand the Colin Firth thing, this is the book for you. If you don't, well then you probably won't get it and might want to skip this one. So anyway, Jane is hung up on an illusion. When her wealthy great-aunt dies, Jane is left a trip to Penbrook Park, where you can pretend you're living in a Jane Austen novel for three weeks. Jane decides to take it as one last hurrah to kick the Firth habit for good. It'll work, right? I will warn you, this is completely different than Hale's other books. It doesn't have her normal literary writing style (because, let's face it, chicklit with literary writing style just doesn't work). That is not to say it isn't good. For those of us who understand the Colin Firth obsession, it's wonderful. I opened it as soon as it arrived on my doorstep, started reading and only stopped to IM my similarly Firth-obsessed friend. We then wished we could go to Penbrook Park and planned all sorts of adventures. It's hilariously funny as well. Also, this is good chicklit. It's not as straightforward as it could be. I like that Penbrook Park was not as perfect as it sounded and was populated by desperate women. Hale really thought this through and didn't take the easy way out. Because, let's face it, Hale is awesome, even when writing chicklit. I hadn't heard about this one - it sounds wonderful! 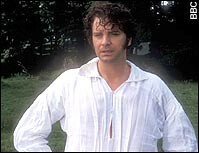 I get the Colin Firth thing, totally.